Catalog. 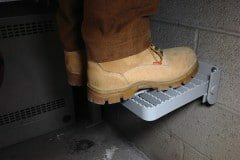 If you need to improve worker access at your location or job site, then an industrial ladder could meet that need for a surprisingly affordable price. Industrial Man Lifts located in St. Petersburg, FL provides several different ladder designs so that a safer and more accessible work environment can be achieved.Industrial ladders are the one tool that everyone has a use for at some point in time. Unlike other types of ladders, the industrial version is created to complete specific tasks in a secure and reliable way. From dock ladders to modular platform systems, industrial ladders can be portable, telescoping, or crossover in style to help you maximize spacial requirements. Investing into a new industrial ladder will provide you or your organization with three immediate benefits. If you need to improve worker access at your location or job site, then an industrial ladder could meet that need for a surprisingly affordable price. Industrial Man Lifts located in St. Petersburg, FL provides several different ladder designs so that a safer and more accessible work environment can be achieved.Industrial ladders are the one tool that everyone has a use for at some point in time. Unlike other types of ladders, the industrial version is created to complete specific tasks in a secure and reliable way. From dock ladders to modular platform systems, industrial ladders can be portable, telescoping, or crossover in style to help you maximize spacial requirements. Industrial ladders are built with high grade materials that meet OSHA safety standards. These ladders will stay in place and offer a stable climbing experience, giving users complete confidence in this tool. Industrial ladders are one of the longest lasting tools that you can use on virtually any project. Typically made from fiberglass or aluminum, your new ladder can be as rugged, durable, or lightweight as you need it to be. Up to 1,000 pounds can be loaded onto certain ladders, while others are suitable for more than one worker. Scaffolding, guardrails, framing, and other customization options may also be available for your project. We even offer galvanized industrial stairways that can give you permanent exterior access to a second floor. Lift ladders. Lift ladders.Industrial ladders are built with high grade materials that meet OSHA safety standards. These ladders will stay in place and offer a stable climbing experience, giving users complete confidence in this tool. Lift ladders. Industrial ladders are one of the longest lasting tools that you can use on virtually any project. Lift ladders.Typically made from fiberglass or aluminum, your new ladder can be as rugged, durable, or lightweight as you need it to be. Up to 1,000 pounds can be loaded onto certain ladders, while others are suitable for more than one worker. Scaffolding, guardrails, framing, and other customization options may also be available for your project. We even offer galvanized industrial stairways that can give you permanent exterior access to a second floor. If you need to improve worker access at your location or job site, then an industrial ladder could meet that need for a surprisingly affordable price. Industrial Man Lifts located in St. Petersburg, FL provides several different ladder designs so that a safer and more accessible work environment can be achieved. It can be a real pain in the neck (or the feet) to be forced to walk around your large machinery. If your setup is a long production run, all that walking around can lead to a lot of lost productivity as well. Then you have some maintenance work that needs to be done before the next project comes in… plus you’ve got all that paperwork which needs to be done back in the administration area. You could keep going around and around. Your workers will be in phenomenal physical shape after a few months of this. Or you could design a space that is more productive, easier to access, and can allow foremen to adequately supervise the work floor without compromising their ability to focus on admin tasks. How do you create such a space? Simple. By utilizing the high-quality ladders, lifts, GSE, and scaffolds from Industrial ManLifts. Every working space is a little different. Industrial ManLifts works with several manufacturers to provide you with product access to a wide range of standardized products, such as ladders or man lifts. 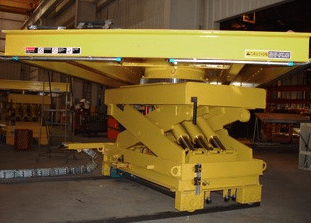 If those standardized products are unable to meet your needs, we also provide a full customization service that will ensure you receive the best possible equipment assets needed to ensure safety and productivity. Ground Service Equipment allows you to perform contracted tasks in virtually any tarmac, hangar, or maintenance environment. You will have access to a network of 40+ global dealers that can provide mobile aluminum towers which are suitable for maintenance needs in virtually every industry. We also offer aircraft maintenance systems that focus primarily on the MRO sector and boiler access solutions in the power generation industry. Up to 10,000 construction workers are injured each year in scaffold accidents, according to information reported by OSHA. About 3 out of every 4 accidents in this category involves a worker slipping, someone being struck by falling debris, or having the scaffold supports give out. You’ll find high-quality scaffold solutions that meet or exceed current government safety standards, which may reduce your risk of having an accident occur at your workplace. Stainless steel man lifts are an effective indoor/outdoor solution for your maintenance or access requirements. Some models can even be operated solo. Compact aerial lifts can save time over other access equipment by eliminating climbing requirements. Each lift can be moved to different positions with ease and give each worker more time working thanks to less setup time. When you have the best possible equipment assets supporting your team, you’ll be able to maximize their productivity. It really is that easy to begin saving money every day. It’s time to stop running around without a plan and begin to focus on your future. Let our team know what your workplace needs happen to be so that together we can secure or create the equipment assets that will drive you forward.